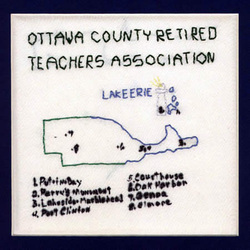 The Ottawa County Retired Teachers began with thirty-three members on November 19, 1968 at Port Clinton High School. A charter was granted on October 22, 1970 with Harriet Peters serving as the first president. Fifty additional retired teachers joined the charter members the first year. As of January 2007, OCRTA has 149 members with 124 having dual membership with both the local and state affiliation. Members continue to perform community and educational outreaches. Each spring, OCRTA provides a book stipend for a high school senior graduating from any accredited high school in Ottawa County. On a regular basis, various members still volunteer in county schools as tutors and readers. Others have opted to serve senior citizens at various county sites. Retired teachers have attended OCRTA meetings via boat and plane as well as by automobile. Covering 255 square miles and having 323 square miles of waterways and 107 miles of shoreline, Ottawa County stretches form Clay Center and Genoa in the west to the Bass Islands in the north to Marblehead in the east and Elmore in the south with Rocky Ridge, Graytown, Oak Harbor, Gypsum and Port Clinton in the middle. As a result, classes taught in schools throughout the county vary from the expected 3-Rs to farming and marine trades. Ottawa, a Native American word for "trader" indicates the diversity of the county. The OCRTA presidents to date includea: Harriett Peters, Verdi Von Thorne, Dr. Russell Smith, Thalia Brown, Avonelle Angus, Grace Borman, Helen Randall, Adeline Schmidlin, Jerry Kissell, Bernice Moritz, Earl Wiseman, Kay Barber, Richard R. Celek, David Wheaton, Edna Hansen, Joyce Doust, Robert Eickel, Ann Klafter and Margaret J. Phillips.